Caption : BANGALORE - 19.08.2010 : Tearing apart... The year old synthetic track at the Sree Kanteerava stadium is already showing signs of wear-n-tear. 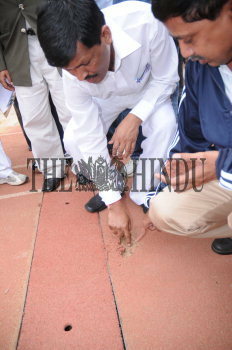 Here State Minister for Textiles, Youth Affairs and Sports Mr Gullihatti D Shekar, is seen inspecting the spot at the long jump runway in Bangalore on August 19, 2010. Photo : K Murali Kumar.